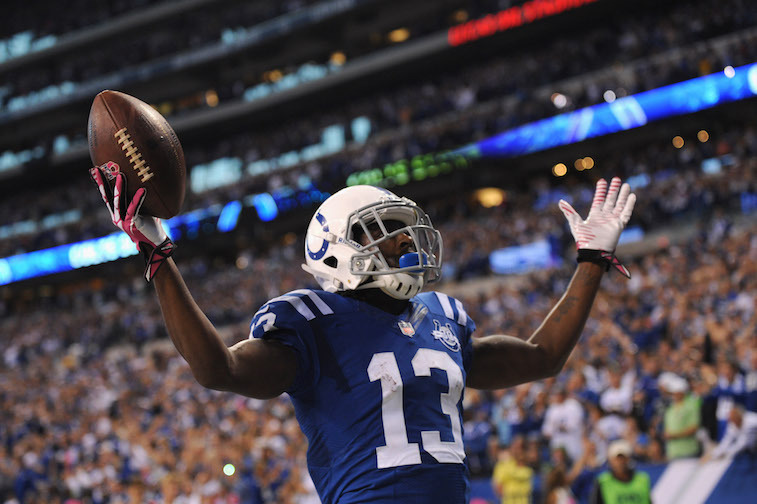 Many people around the NFL believe that wide receiver is the most dependent position in the game. Those individuals would argue that a top-notch quarterback will make his receivers look a lot better than they actually are. While that is true to a certain extent, there is no denying that there are certain wide receivers who are talented enough to put up huge numbers and earn Pro Bowl bids regardless of who their quarterback is. These are the same types of wideouts who have the ability to change games and open things up for the rest of their team’s offense every time they step onto the field. Having an elite wide receiver that possesses the traits we just described is a luxury that most NFL teams are not fortunate enough to possess. The teams that are lucky enough to have an elite wide receiver on their roster usually have the makings of an excellent wide receiver corps. With less than a week until training camps kick off around the NFL, we decided to take a look into which teams have the best groups of wide receivers in the league heading into the season. Our analysis was based on each team’s top three wide receivers – using statistics from the 2014 season – and excludes all tight ends and the 2015 class of rookies. We fully expect this list to be vastly different by the end of the season when rookies and other unproven veterans have developed into productive players. One team in specific that we expect to join this list is the Pittsburgh Steelers. 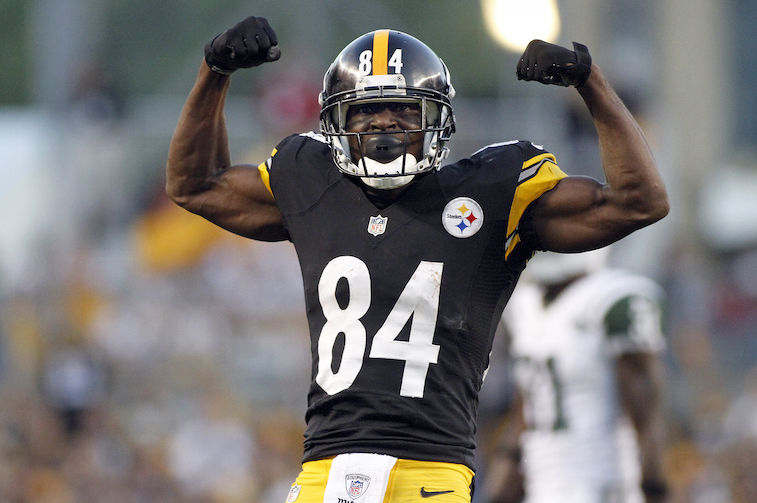 They already have Antonio Brown (pictured above), who is arguably the best wide receiver in the league, and if Martavis Bryant can take the next step in his development in his second NFL season, the Steelers have the makings of what could potentially be the best 1-2 punch at wide receiver in the league. But for now, we kept our focus on players who have already proven that they can produce at a high level in the NFL. Without further ado, here is a look at the top seven wide receiver corps heading into the 2015 season. A.J. Green (pictured above) is arguably the top deep threat in the league, and 2015 is a contract year for the two-time All-Pro. In only 13 games a year ago, Green caught 69 passes for 1,041 yards and six touchdowns. On the other side, the Bengals have 25-year-old Mohamed Sanu, who had his best season as a pro in 2014 catching 56 passes for 790 yards and five touchdowns. The X-factor for the Bengals’ receiving corps is Marvin Jones. The former California Golden Bear was quietly emerging as a potential star in 2013, but missed the entire 2014 season with a myriad of injuries. 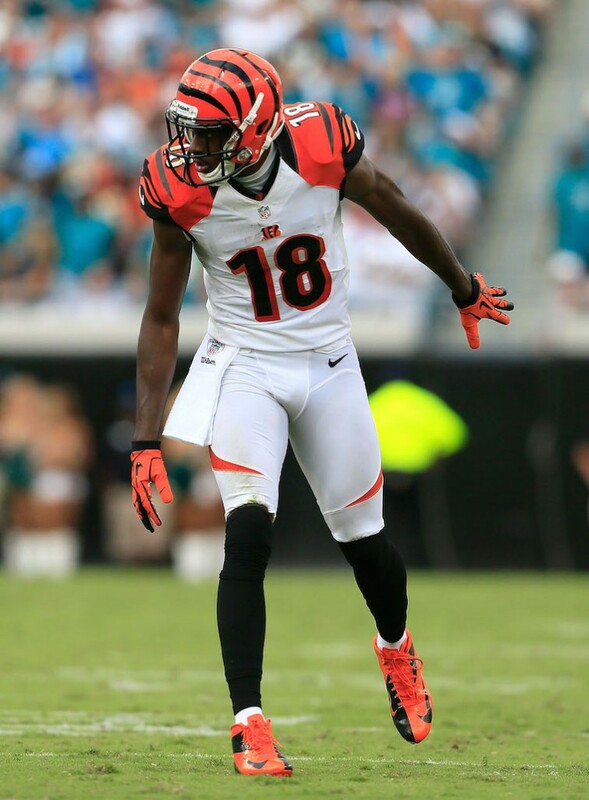 He is reportedly back to full strength and his presence will give Cincinnati three excellent options at wide receiver for the 2015 season. 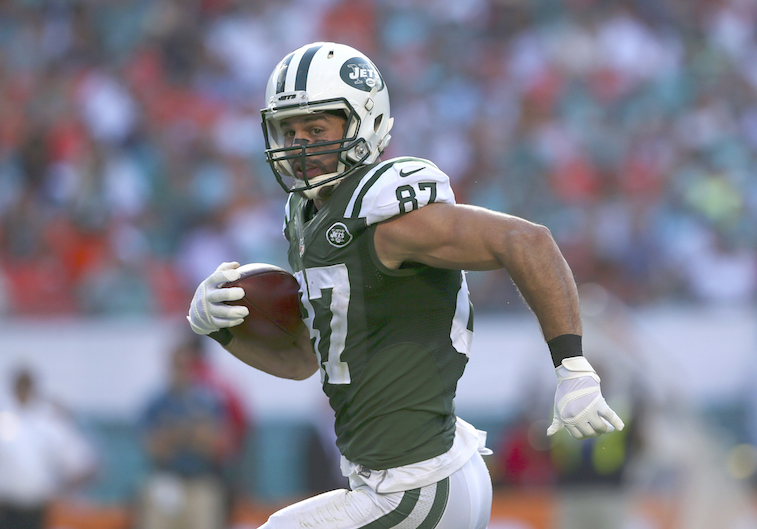 The Jets have assembled a group of wide receivers that would make most quarterbacks salivate. Eric Decker has multiple seasons with over 1,000 receiving yards and double-digit touchdown receptions to his name, and when it’s all said and done, Brandon Marshall, who was acquired in an offseason trade, will likely have a Hall of Fame-caliber resume. Jeremy Kerley has proven to be an explosive threat out of the slot and in the return game. On top of that, the team added former Ohio State standout Devin Smith in the second round of the 2015 NFL Draft. If Smith is as good as advertised, the Jets could have four above average options for quarterback Geno Smith to throw to in 2015. Julio Jones is as good as any wide receiver in the league, and will be playing the 2015 season with the intentions of earning a massive contract extension next offseason. At the same time, the sun may be on the verge of setting on Roddy White’s potentially Hall of Fame-caliber career, but the 10-year NFL veteran is still more than capable of posting a 1,000-yard receiving season in 2015. 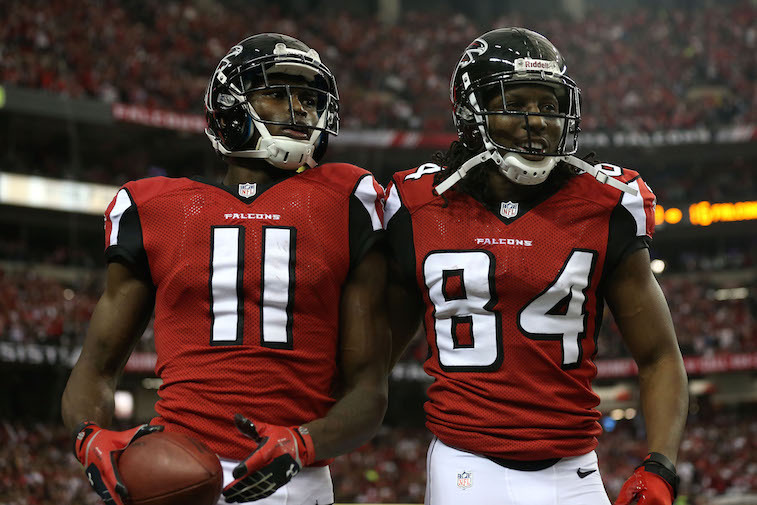 With those two on the outside, and Devin Hester in the slot, there is no arguing that the Falcons have one of the best wide receiver corps in NFL heading into 2015. Andre Johnson has a place waiting for him in the Pro Football Hall of Fame when he decides to hang his cleats up. For the first time in his career, the 12-year NFL veteran will get to play with an elite quarterback in Andrew Luck, which we believe will result in yet another 1,000-yard receiving season for the four-time All-Pro. On the other side is an emerging star named T.Y. Hilton, who caught 82 passes for 1,345 yards and seven touchdowns last season. Hilton is extremely explosive and can play on the outside and out of the slot. The No. 3 wide receiver in Indianapolis is Donte Moncrief, who has the potential to be one of the NFL’s breakout players in 2015. With Luck throwing them the ball, it is entirely possible that all three of these guys could post 1,000 or more receiving yards this season. The Lions are one of the rare NFL teams who have two legitimate No. 1 options at wide receiver. 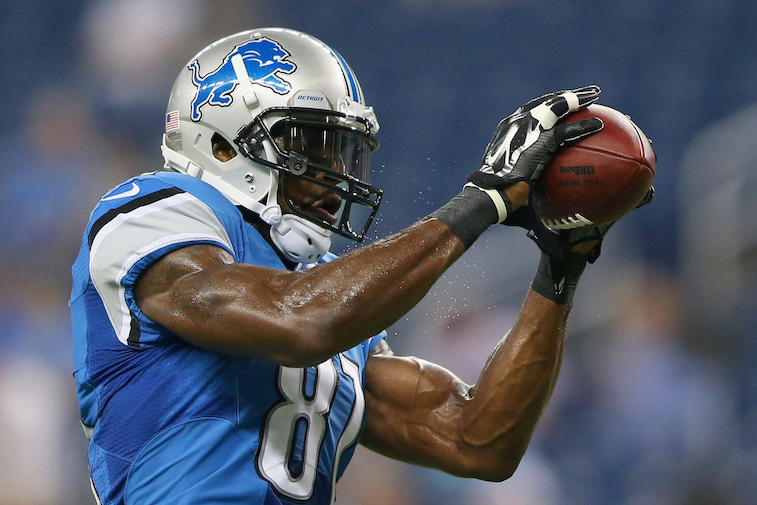 When he is healthy, it’s hard to argue that Calvin Johnson isn’t the best wide receiver in the league. On the other side is Golden Tate, who signed with the team prior to the 2014 season. In Tate’s first season in Detroit, the former Notre Dame standout caught 99 passes for 1,331 yards and four touchdowns. In the slot, the Lions will have Jeremy Ross, a diminutive, yet explosive playmaker who is a threat to score anytime he touches the ball. Nonetheless, the combination of Johnson and Tate alone gives the Lions one of the best wide receiver corps in the league. If this list were based off of wide receiver duos, the Broncos would have been our top ranked team. 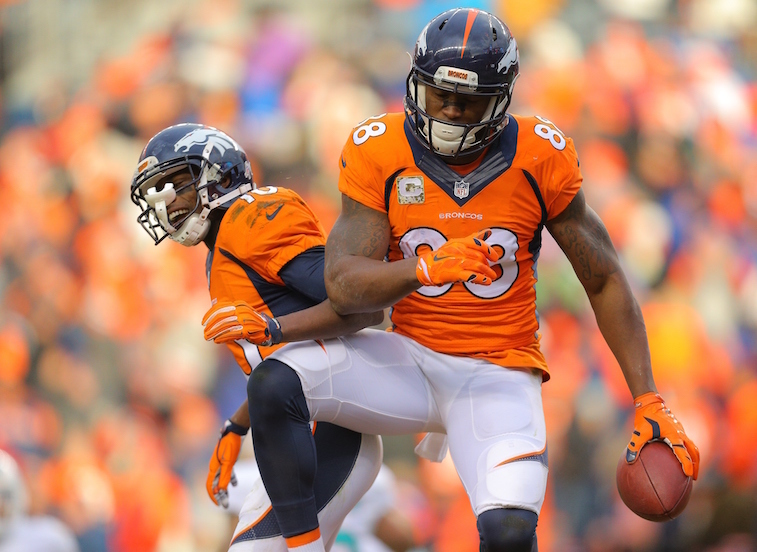 Demaryius Thomas, who recently signed a mega contract extension, and Emmanuel Sanders were both Pro Bowlers in 2014 and both finished in the top five of the NFL in receptions and receiving yards. 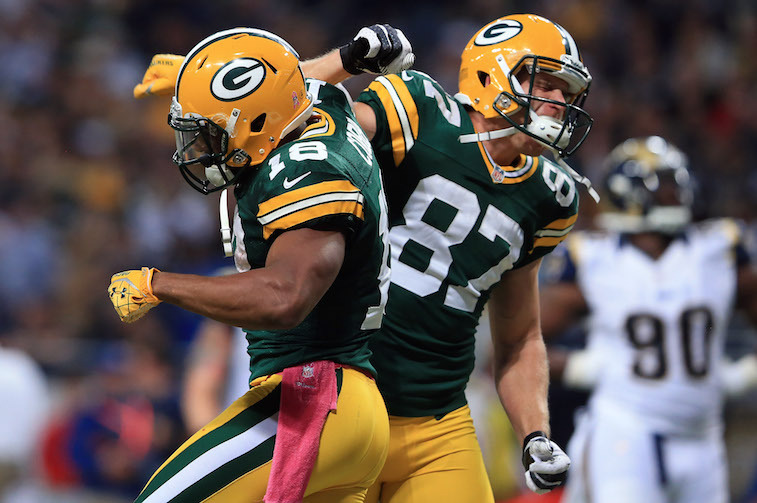 Last year, Thomas caught 111 passes for 1,619 yards and 11 touchdowns, and Sanders caught 101 passes for 1,404 yards and nine touchdowns. As of now, we are projecting Andre “Bubba” Caldwell as their third wide receiver, but most people with knowledge of the situation expect Cody Latimer, the team’s 2014 second round draft pick, to take over that role by the end of the season. A lot of people give Peyton Manning all of the credit for this group’s success, but we firmly believe that they are talented enough to produce similar numbers regardless of who is playing quarterback.